Supply Chain is the management of flows. 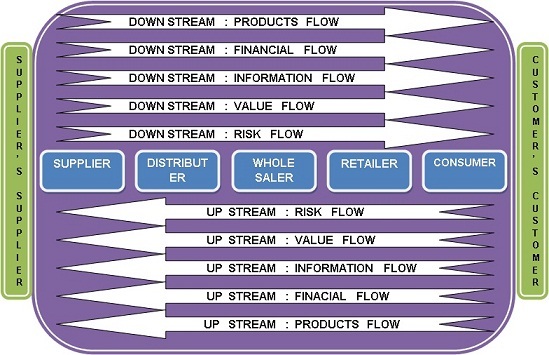 There are Five major flows in any supply chain : product flow, financial flow, information flow, value flow & risk flow. The product flow includes the movement of goods from a supplier to a customer, as well as any customer returns or service needs. The financial flow consists of credit terms, payment schedules, and consignment and title ownership arrangements. The information flow involves product fact sheet, transmitting orders, schedules, and updating the status of delivery. Product Flow includes movement of goods from supplier to consumer (internal as well as external), as well as dealing with customer service needs such as input materials or consumables or services like housekeeping. Product flow also involves returns / rejections (Reverse Flow). In a typical industry situation, there will a supplier, manufacturer, distributor, wholesaler, retailer and consumer. The consumer may even be an internal customer in the same organisation. For example in a fabrication shop many kinds of raw steel are fabricated into different building components in cutting, general machining, welding centres and then are assembled to order on a flatbed for shipment to a customer. Flow in such plant is from one process / assembly section to the other having relationship as a supplier and consumer (internal). Acquisition is taking place at each stage from the previous stage along the entire flow in the supply chain. In the supply chain the goods and services generally flow downstream (forward) from the source or point of origin to consumer or point of consumption. There is also a backward (or upstream) flow of materials, mainly associated with product returns. The financial and economic aspect of supply chain management (SCM) shall be considered from two perspectives. First, from the cost and investment perspective and second aspect based on from flow of funds. Costs and investments add on as moving forward in the supply chain. The optimization of total supply chain cost, therefore, contributes directly (and often very significantly) to overall profitability. Similarly, optimization of supply chain investment contributes to the optimisation of return on the capital employed in a company. In a supply chain, from the ultimate consumer of the product back down through the chain there will be flow of funds. Financial funds (Revenues) flow from the final consumer, who is usually the only source of “real” money in a supply chain, back through the other links in the chain (typically retailers, distributors, processors and suppliers). In any organization, the supply chain has both Accounts Payable (A/P) and Accounts Receivable (A/R) activities and includes payment schedules, credit, and additional financial arrangements – and funds flow in opposite directions: receivables (funds inflow) and payables (funds outflow). The working capital cycle also provides a useful representation of financial flows in a supply chain. Great opportunities and challenges therefore lie ahead in managing financial flows in supply chains. The integrated management of this flow is a key SCM activity, and one which has a direct impact on the cash flow position and profitability of the company. Supply chain management involves a great deal of diverse information–bills of materials, product data, descriptions and pricing, inventory levels, customer and order information, delivery scheduling, supplier and distributor information, delivery status, commercial documents, title of goods, current cash flow and financial information etc.–and it can require a lot of communication and coordination with suppliers, transportation vendors, subcontractors and other parties. Information flows in the supply chain are bidirectional. Faster and better information flow enhances Supply Chain effectiveness and Information Technology (IT) greatly transformed the performance. A supply chain has a series of value creating processes spanning over entire chain in order to provide added value to the end consumer. At each stage there are physical flows relating to production, distribution; while at each stage, there is some addition of value to the products or services. Even at retailer stage though the product doesn’t get transformed or altered, he is providing value added services like making the product available at convenient place in small lots. These can be referred to as value chains because as the product moves from one point to another, it gains value. A value chain is a series of interconnected activities which are required to bring a product or service from conception, through the different phases of production (involving a combination of physical transformation and the input of various product services), delivery to final customers, and final disposal after use. That is supply chain is closely interwoven with value chain. Thus value chain and supply chain are complimenting and supplementing each other. In practice supply chain with value flow are more complex involving more than one chain and these channels can be more than one originating supply point and final point of consumption. In chain at each such activity there are costs, revenues, and asset values are assigned. Either through controlling / regulating cost drivers better than before or better than competitors or by reconfiguring the value chain, sustainable competitive advantage is achieved. Risks in supply chain are due to various uncertain elements broadly covered under demand, supply, price, lead time, etc. Supply chain risk is a potential occurrence of an incident or failure to seize opportunities of supplying the customer in which its outcomes result in financial loss for the whole supply chain. Risks therefore can appear as any kind of disruptions, price volatility, and poor perceived quality of the product or service, process / internal quality failures, deficiency of physical infrastructure, natural disaster or any event damaging the reputation of the firm. Risk factors also include cash flow constraints, inventory financing and delayed cash payment. Risks can be external or internal and move either way with product or financial or information or value flow. Demand risks – related to unpredictable or misunderstood customer or end-customer demand. Supply risks – related to any disturbances to the flow of product within your supply chain. Environment risks – that originate from shocks outside the supply chain. Business risks – related to factors such as suppliers’ financial or management stability. Physical risks – related to the condition of a supplier’s physical facilities. Manufacturing risks – caused by disruptions of internal operations or processes. Business risks – caused by changes in key personnel, management, reporting structures, or business processes. Planning and control risks – caused by inadequate assessment and planning, and ineffective management. Mitigation and contingency risks – caused by not putting in place contingencies. Supply chain management integrates key business processes from end user through original suppliers, manufacturer, trading, and third-party logistics partners in a supply chain. Integration is a critical success factor in a dynamic market environment and is prerequisite for enhancing value in the system and for effective performance of the supply chain by sharing and utilization of resources, assets, facilities, processes; sharing of information, knowledge, systems between different tiers in the chain and is vital for the success of each chain in improving lead-times, process execution efficiencies and costs, quality of the process, inventory costs, and information transfer in a supply chain. Integration leads to better collaboration for synchronized production scheduling, collaborative product development, collaborative demand and logistic planning. Also with increased information visibility and relevant operational knowledge and data exchange, integrated supply chain partners can be more responsive to volatile demand resulting from frequent changes in competition, technology, regulations etc. (capacity for flexibility). Integration is required not only for economic benefits but also for compliances in terms of social and community, diversity, environment, ethics, financial responsibility, human rights, safety, organizational policies, industry code of conduct, various national / international laws, regulations, standards and issues. To achieve superior supply chain performance (cost, quality, flexibility and time performance) require multi-lateral integration : Internal / External integration; Functional integration, Geographical integration; Integration in Chains and networks; and Integration through IT. The integration even goes beyond to include supplier’s supplier and customer’s customer to leverage the power of the “network,” beyond their own.